Dwight Eisenhower was a five-star general and 34th President of the United States. He helped win, then stop, hot wars (World War II and Korea), and navigated the country through eight years of the Cold War. He is also know for his domestic accomplishments, like the Interstate Highway System. One poll I found rates him as our fifth-best president (https://www.cbsnews.com/pictures/presidents-ranked-from-worst-to-best-presidential-historians-survey-2017/40/). So what was his secret? 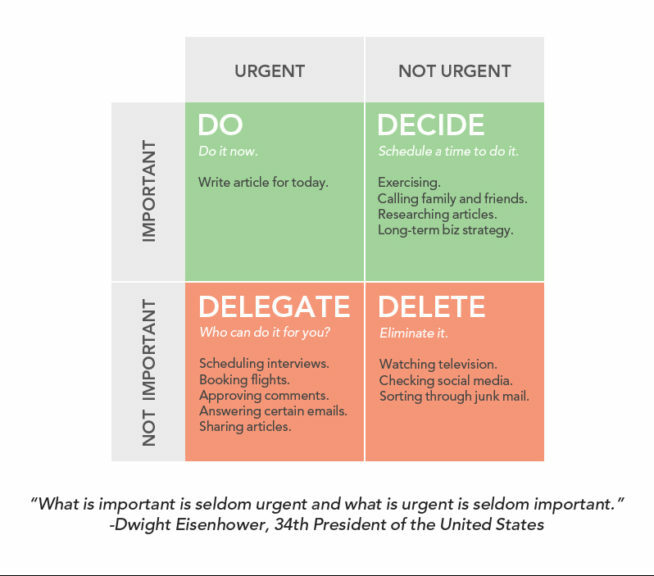 The highest priority is “Important” and “Urgent”. Long-term goals that don’t have a firm deadline are “Important”, but “Not Urgent”. Tasks that can be put off until the Important and Urgent jobs are finished or can be delegated are “Not Important”, but “Urgent”. Finally, everything that can be considered “Not Important” and “Not Urgent” end up in the last box and can actually be eliminated. But What Did Einstein Actually Say?